A fiery tangy chutney ideal accompaniment for dosa and idli. Peel shallots and keep aside. If the shallots are bigger in size, cut them into smaller pieces. In a deep pan, add a teaspoon of oil and saute the shallots along with garlic and dry red chilies. Saute in medium heat for 2-3 mins. When shallots turn translucent, add tamarind and salt. Switch off the flame. Let this cool and then grind into a smooth paste in the mixer along with 2-3 tbsp of water. Heat half a tsp of oil. Add mustard seeds. When they crackle, add curry leaves, switch off the flame and add this tempering to the chutney. 1. You can skip tamarind if you do not like tangy taste. 2. You can use red onions to make this chutney but the taste will not be the same. Onions are sweeter and shallots are spicy. A thick side dish for rice or roti made of colocasia stems, pumpkin, and cow peas. This is one of those rare Kerala dishes without coconut. This is a dish with thick gravy . Colocasia plants, just like coconut and banana plants/trees are commonly found in a Kerala backyard. Dishes using colocasia stem and leaves are very common in the village. These recipes are now getting forgotten due to unavailability of ingredients and people forgetting these age old recipes. Pressure cook the cow peas separately in some water and keep it aside. Be careful that they do not get mashed. Peel the skin from colocasia stem and dice into cubes. The colocasia stem pieces shrinks to 1/4th size when cooked. So you may cut in one-inch sized cubes. Peel and dice pumpkins (you may choose to add the skin also if the pumpkin is organic and good quality). In a thick bottomed pan, cook diced colocasia stems and pumpkin pieces with turmeric powder and just a sprinkle of water. Colocasia stems are a little watery so once heated, they would release some water. Check every few minutes and add water if you think it is needed. When the colocasia stems and pumpkin pieces get cooked, add the tomato pieces and boiled cow peas. You may add thick tamarind extract instead of tomato. Some colocasia stems tend to itch. Hence, it is important to add either tamarind extract or tomato. Add chili powder and salt to taste. While this is getting cooked, peel and chop the shallots finely. Heat oil in a small pan and add the chopped shallots and roast them until golden brown. Add curry leaves and the whole dry red chili also. Mix with the cooked vegetables. Taste and adjust salt. A nutritious and tasty side dish for dosa, idli, chapati, or even with rice. Very similar to Sagu, the mixed vegetable curry. Method: Peel the potatoes and chop into small cubes. Peel the drumstick. You may just scrape to remove the green outer part. The hard shell can remain. Chop into a 2-inch long pieces. Peel and chop the onions finely. Peel and crush the ginger, garlic, and green chilies into a coarse paste. Chop the tomato pieces finely. Add coconut oil into a wide bottomed pan. Add the crushed ginger, garlic, green chilies paste as well as the whole spices (cardamom, bay leaf, and cloves). Saute until the raw smell disappears. You may choose to remove the whole spices after the flavors are released. Add the finely chopped onion pieces and curry leaves. Saute. Add chopped tomato pieces. Saute until you see oil seeping out. Add coriander powder. Saute and cook for 2-3 minutes. Add chopped potato and drumstick pieces. Stir. Add a cup of water. Empty one packet of coconut milk powder into one cup water to make a thin coconut milk. Add this to the vegetables. Close with a lid and cook for 10 minutes stirring occasionally until gravy thickens and potatoes and drumsticks look well cooked. Add salt, cover and cook for 2 more minutes. If desired, you can mix another 25 gms of coconut milk powder in warm water to make a cup of thick coconut milk and add this thick coconut milk to the dish. This is optional. Remove from fire. Garnish with freshly ground pepper, if desired. Notes: If you do not wish to have the shell of the drumstick, you may cook drumstick separately, squeeze out the pulp and use that for the korma instead of adding whole drumstick pieces. It is recommended that we use greens daily in our diet. Indians have various recipes to use locally available greens. One of the local recipe around the regions in Tamil Nadu and parts of Kerala mainly dominated by the Tamil community is a preparation called mashiyal, which literally means mashed. Keerai mashiyal is nothing but mashed greens. You may puree the greens or decide to just cook them, add lentils along with them mashed greens, and choose your own favorite kind of seasoning for the mashed greens. The mashiyals that traditional Tamil Iyer community makes does not use shallots/onions. You may use your discretion to add or skip shallots. Lentils is a good way to add volume as well as protein in your mashiyal but this is optional too. If you are adding lentils, rinse the dal thoroughly, add a cup of water, and cook it well. Mash and keep aside. Wash, clean, and chop the spinach. Keep aside. Peel the pearl onions/shallots and chop them finely. Chop green chilies finely. Keep aside. In a wok, add oil and mustard seeds. When the mustard seeds splutter, add the urad dal. Roast the dal until they turn red and add the dry red chilies. Add the finely chopped shallots and green chilies. Saute until shallots turn pink. Add the finely chopped spinach, along with quarter cup of water, and a pinch of turmeric powder. Cover and let this cook until the greens get cooked, stirring occasionally. Add the required amount of salt. When the greens are cooked well, add the mashed dal. Taste and adjust the salt. Notes: If you do not have shallots, you may use red onions but the taste does vary slightly. Red onions are slightly sweet whereas shallots are spicy. You may avoid onions/shallots and choose to add just a seasoning of oil, mustard seeds, urad dal, and dry red chilies. 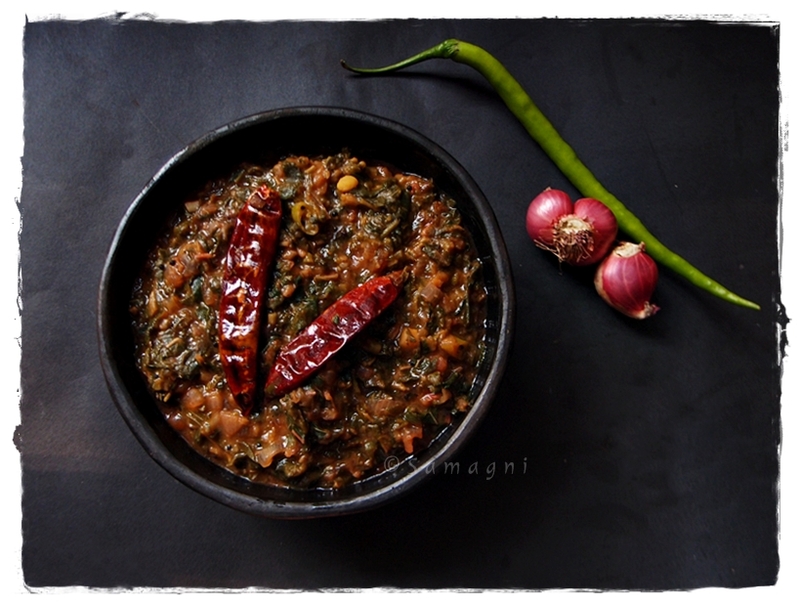 A spicy and tangy kozhambu (gravy) just right for the winter / rainy season. Especially good to treat common cold and chest congestion. Ingredients may be many but the method is very simple and easy. You will definitely get hooked to its taste. Add a teaspoon of sesame oil to an iron pan. Add peppercorns, urid dal, chana dal, dry red chili, and coriander seeds. Stir continuously and roast the ingredients. When the urid dal starts turning color, add fenugreek seeds, cumin seeds, hing powder, and curry leaves. Stir fry until jeera seeds start spluttering and the dals have turned red. Turn off the fire, transfer to a bowl or plate and let this cool. When the roasted ingredients have cooled down, pulse this in a mixture to make a fine and smooth paste. You may add small quantities of water also. Add a cup of lukewarm water to tamarind and soak it for 2-3 mins. Extra the tamarind juice and remove and discard the pulp. Heat a pot and add a teaspoon of sesame oil and mustard seeds. When the mustard seeds start spluttering, add curry leaves. Now add the tamarind juice to the pot. Add turmeric powder. Bring to boil. Add the required amount of salt. Add jaggery powder, mix, and bring to boil. Add the smooth paste of the roasted ingredients into the boiling tamarind. Stir well. Taste and adjust salt, pepper, or jaggery as per taste. Boil until the gravy thickens and oil starts appearing on top of the gravy. You can serve this as a gravy with rice or mix this with cooked rice to make milagu kuzhambu sadam. 1. If you boil until the gravy thickens, you can store this gravy and mixed it with desired quantities of cooked rice to make instant milagu kuzhambu sadam, which is like a one-pot meal that can be served with papad or some stir fried vegetables. The gravy can be stored in refrigerator up to 15 days. 2. To make another version of this gravy, you can add sauteed shallots or garlic when boiling the tamarind. 3. It is important to use sesame oil to make this kuzhambu to get the authentic taste and flavor. Fruit salads are my favorites more than vegetable salads – Not the ones with a dollop of ice cream but the kinds that have just real fruits with some lemon juice dressing. Eating fruits as-is is good enough but a pinch of black salt, a dash of lemon, and a few mint leaves lends them an exotic flavor. Chill them a little in the refrigerator and it turns delectable. 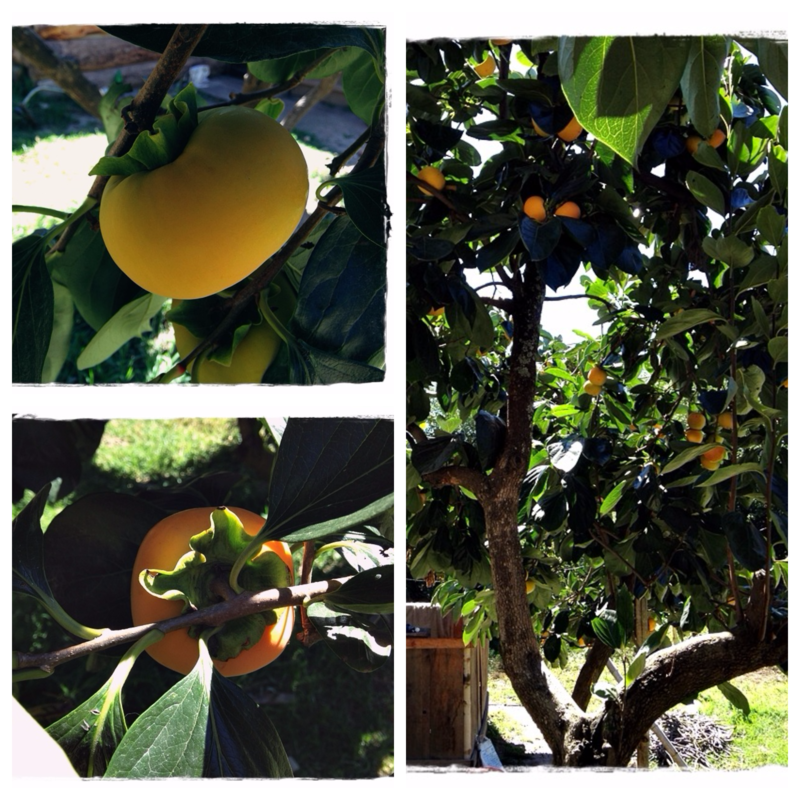 Late October and November is the season for both persimmons and pomegranates. This is the best time to make this salad with these seasonal fruits. I first ate persimmon two years ago during a visit to Bhutan and had never seen them in India. Couple of days ago I was surprised to come across these in the local market. Glad to see that Persimmon is cultivated even in India. Even if you do not have persimmon, you may substitute it with the crunchy variety of pear to make this salad. But it is important that you use the crunchy variety of pear and apple to make this salad. A crunchy and sweet apple gives this salad the right texture. A sloppy squishy sour apple is a bad choice and can ruin the salad. This is a perfect salad to be served BEFORE a meal. Most people in India serve fruit salad with custard or ice cream AFTER a meal. But this is a wrong combination as per Ayurveda and wrong timing that can cause acidity and indigestion. The digestion time for fruits and uncooked vegetables is lesser than that of cooked meals and hence they should be consumed first. Vice versa could result in bloating. Add salt and lemon juice to the cut fruits. This retards oxidization and arrests the loss of nutrients. Toss the rest of the ingredients together. Refrigerate for half an hour before serving. Notes: You may replace Persimmon with a crunchy variety of pear. You need to use only crunchy vegetables for this salad. Congee/Kanji is comfort dinner for most Keralites. Watery kanji served along with proteins in the form of legumes or beans is well suited for the hot and sweaty tropical climate. Like how butter is a must with bread, chammanthi is a must with kanji (rice gruel). Grate the coconut. Peel the garlic and shallot. Pass a skewer through the chilies, garlic, and shallots and roast them directly on fire. Do not char them. Just a little bit of burning is good enough. the consistency is tight and not watery. Serve along with rice gruel or steamed rice. Notes: You can grind the ingredients raw and make a chutney, but the smoky flavor when you roast the chilies, shallots, and garlic on fire lends the chutney a really unique flavor making it an interesting accompaniment with the bland kanji. You may avoid garlic if you wish to.